+++++“Miss Mary Frances Garrigus, instructor in shorthand at the Carbon county high school, succumbed Saturday afternoon to pneumonia following an attack of influenza. Miss Garrigus has been serving voluntarily as a nurse at the emergency hospital in this city since its organization and contracted the fatal malady in the discharge of those duties. She had been ill only four days. +++++In the death of Miss Garrigus the high school loses a valued member of its staff and the community a ready, willing and capable worker. She was a daughter of Mr. and Mrs. W. G. Garrigus of Billings and came to Red Lodge last September to accept a position with the high school. The remains were taken to Billings Sunday for burial, accompanied by the bereaved father. 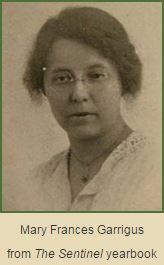 +++++Miss Garrigus was born at Stillwater, which is now Columbus, August 22, 1891. She attended the Billings high school and was graduated with the class of 1912. Later she took the law course at the University of Montana at Missoula, graduating from that institution last June. +++++In her will and as a last request, Miss Garrigus requested that her remains be taken to Missoula for interment as she considered that her home. Beautiful floral offerings from the Red Cross here and from many friends in this city and elsewhere in Montana attested the high esteem in which she was held. Just found out about the site in the state bar magazine! Love it and want to read it all. But Jeannette Rankin is 2 “N’s”!